Swarovski Optik announced a new binocular spotting scope system, the BTX. 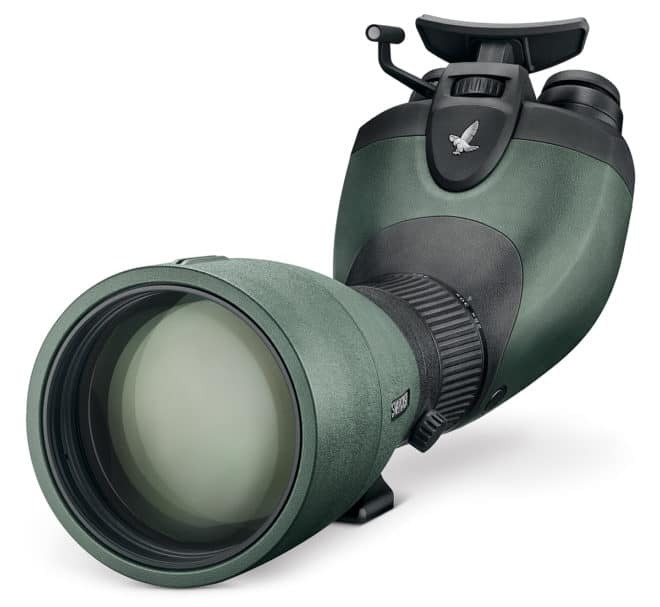 It is a unique kind of spotting scope system as it lets you combine different optical lenses with the eyepiece. The best part about the eyepiece is that it is styled like a binocular and it is angled. This allows you to use both eyes while watching and prevents strenuous squinting that single-eye solutions require. This combination of a two-lens eyepiece in combination with a spotting scope optic provides a revolutionary new viewing experience. 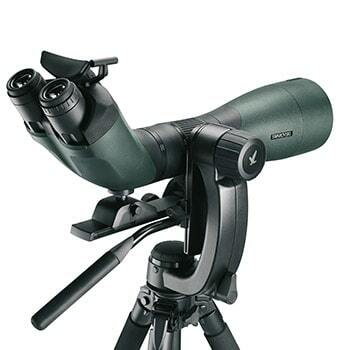 It combines the benefits of both a spotting scope and a binocular in one system. The result is that you can look for longer periods of time comfortable through the scope. The angled position of the eyepiece also allows ergonomically advantageous positioning of your head to look. The forehead rest makes it relaxing to watch the wildlife around you through the scope. Swarovski offers three different optics for the eyepiece. You can choose the between the 30x65, the 30x85 and the 35x95 optics. All are built to highest specifications by Swarovski, utilizing their Swarovision technology. This reproduces even the smallest details with unmatched color fidelity and razor-sharpness. The 30x65 objective module provides a 30x magnification with a 65 mm lens. The field of view for this optic is 112 feet at 1000 yards. The shortest focusing distance is 7.2 feet. The next level up is the 30x85 objective. It also features a 30x magnification but with a 85mm lens. This provides more light to be able to pass into the scope for better low-light view. This objective has a field of view at 1000 yards of also 112 feet. It needs more distance for a clear focus with a shortest focusing distance of 12.5 feet. The high end objective is the 35x95. As you might have guessed, it offers a 35x magnification with a 95mm lens. The FOV @ 1000 yards is 96 feet. Also as expected, the shortest focusing distance is farther out at 16.4 feet. If a maximum of 35x magnification is not enough then you can add the ME 1.7x magnification extender to bring it up to 60x. This allows for seeing even the smallest details at long distances. The angled view provides a comfortable position for a hunter of nature lover to observe the environment for hours. The forehead rest is adjustable to make the overall viewing experience even more comfortable. The BTX system is compatible with all existing Swarovski objective modules in the ATX and STX family. The existing accessories can be used on the BTX system which allows you to pick from a wide variety of options and accessories. This new spotting scope will be available in May of 2017. It definitely is worth the wait!